How was your Cinco de Mayo weekend? We celebrated with some festive foods such as tacos and I also baked some gluten-free chocoflan. We stayed home most of the weekend because on Saturday we brought home a doggy! We are watching him for the week and if he meshes well with us and our dog Pipi (who has made some appearances in previous posts), then he can stay! He is a 7 year old Pekingese named Nutter. Isn’t he so cute? He has one eye but that doesn’t stop him from being a fun and cute dog. He kept me company while I was in the kitchen cooking. I think that it’s his favorite place in the apartment. Nutter is a mellow dog who reminds me of the late Swift, my dog of my teen and adult years who I wrote about recently. With Nutter by my side in the kitchen (Pipi stayed close to my husband while I cooked since she’s a daddy’s girl), most of the time spent on this dessert was on making the cajeta, or caramel sauce. I used Pati Jinich’s recipe found here, but you can use store-bought cajeta or dulce de leche (also goes by manjar blanco). I used part goat milk and cow milk, but all cow milk is fine. For a vegan cajeta, Joel Luks recipe looks great. I decided to make the caramel into a specific type of cajeta called cajeta envinada by adding 1/2 cup of rum (popular gluten-free brands: Bacardi, Malibu, Cruzan, Captain Morgan). You could also use rum extract for the flavor if you like that better. This sauce goes on the bottom of the chocoflan pan/molds for that distinctive flan color and flavor. I also added some chopped dark chocolate in the cake batter. Aim for mini chip size for a nice little pockets of chocolate throughout the cake. I could imagine using other add-ins that you might find in a chocolate cake, such as mini M&Ms, white chocolate chips, peanut butter chips, other types of chopped chocolate candies, chopped nuts, or even bacon, like in this chocolate cake recipe? I’ve been on a mini dessert kick (great portion for a dessert craving and for parties!) 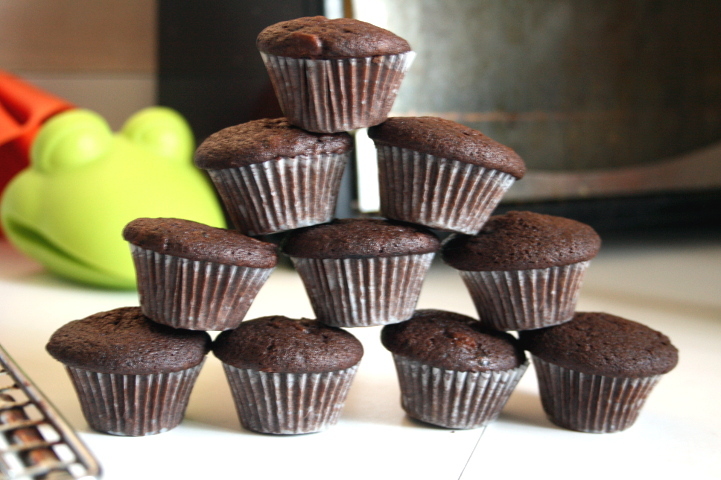 so I made these chocoflans cupcake-sized using a silicone liner and paper liners on top of those to help get them out after baking. On the bottom is a layer of cajeta, then the chocolate cake batter, and then the custard. Don’t worry if the layers are uneven, they will straighten out while baking. They bake in a water bath in which the filled molds are placed in a baking pan/casserole dish filled with hot water up to half way up the molds. Magically, the cake batter floats to the top! Like this! I only had 24 silicone cupcake molds so there was enough cake batter and custard to fit the 24 cupcake molds plus two 8’x4′ loaf pans. I put each loaf pan in a larger 9″x5″ loaf pan for the water bath. After un-molding, you can top these with more cajeta, with some chopped pecans (or other types of nuts), some chocolate sauce, fruit sauce, sliced fresh fruit such as strawberries, or maybe some bacon! If you can’t already tell, we are bacon lovers, especially the really good grass-fed ones. It’s a stunning dessert. But don’t forget all the layers. I forgot to put the cajeta on the bottom of the pan so I had to spoon it over after baking. Don’t do what I did and forget the cajeta layer! That is what gives flan that characteristic flavor and look. This chocoflan was still delicious though. Lesson learned. I don’t mind sharing my mistakes if it helps you. Food mistakes can still be tasty as this dessert was. Now I know for next time and so do you! Making this chocoflan has made me realize that in this imperfect world, errors can elevate you. 😀 Ok enough of the corny rant on mistakes and forgotten cajeta, let’s get back to the recipe! Heat oven to 350 degrees F. Prepare molds by spraying with cooking oil or brushing on butter. Pour the cajeta into the molds, evenly dividing the cajeta among them. Mix the cake batter: Cream the butter and sugar on medium-high for a few minutes until fluffy. Add the egg and mix for a minute or so until thoroughly combined. In another bowl, whisk together the dry ingredients: flour, cocoa, baking powder, baking soda, salt and guar gum. With the mixer on, add half of the buttermilk and half of the dry ingredients and mix until combined. Add the remaining buttermilk and dry ingredients, mixing until batter is blended and there are no pockets of flour. Mix the custard: In a blander, combine the evaporated milk, condensed milk, eggs, and vanilla. Blend until smooth. Assemble: On top of the cajeta layer, first put a layer of cake batter in each mold and then a layer of custard. Put into a pan and fill the pan with hot water half-way up the molds. Cover the pan with foil or pan-lining paper. Carefully place the pan in the oven and bake for 50-55 minutes until a toothpick inserted comes out clean and moist (not very wet). Be careful when removing the foil as hot steam will rise. Cover with foil or plastic wrap and refrigerate for at least 2 hours before serving. Serve with your favorite toppings such as those listed above. This entry was posted in Baking, Food, Gluten-Free, Holidays, Recipes and tagged Cajeta, Cake, Caramel, chocoflan, Chocolate Cake, Cinco de Mayo, Dessert, flan, gluten-free dessert, Gluten-free diet. Bookmark the permalink. I am about to take a bite out of my laptop screen!!!! I just couldn’t bear to put myself through reading the recipe after those gorgeous photos!!! YUM!!!! 😀 Going to meet with the animal rescue this evening to officially adopt him. Yay! Sometimes I am tempted to grab the jar at times for spoons of cajeta. Wow, those look scrumptiously delicious!!! Thank you 🙂 Takes a little while to make them, but it is not so hard. Besides the regular Spanish Flan, I also make a Orange Almond Flan. It is different, but tasty. I got the recipe from Pati’s Mexican Table (on PBS). I think her mother is Mexican and her dad is Arab. So she mixes the two food cultures and she explains many Mexican ingredients originate from the Arab world. As well as some of the words in the Mexican language. Here is the link if you would like to give the flan a try: https://www.dropbox.com/s/3dlwa3ccu2g8nct/Orange%20Almond%20Flan.docx . You can also see her on your PC I believe. Just go to the PBS website and look her up. I have done that for MPR or Public Radio. I love the mini desserts. It would be hard to self control with these, they look so delicious! Cute little dog! Mini cakes are such a cute thing! ohhhhhh I want!! dessert and little dog hahahahaha. 😀 Dessert and a little dog–a couple of life’s little joys! Love it! Have tried this. Also mocha. And pandan. And mango. So fun! Thanks 🙂 Those sound good. I think I’ll have to try those flavors sometime! Hope Nutter and Pipi are good friends by now! I’m a dog lover as well and got 2 rescue dogs. They’re amazing! And so is this recipe!